Green smoothies for life, 10-day cleanse, recipe book and ketogenic 4 books collection set Description: Green Smoothies for Life: A brand-new meal plan that will assist readers with incorporating green smoothies into their everyday routine while developing healthier long-term eating habits and improving their overall health. 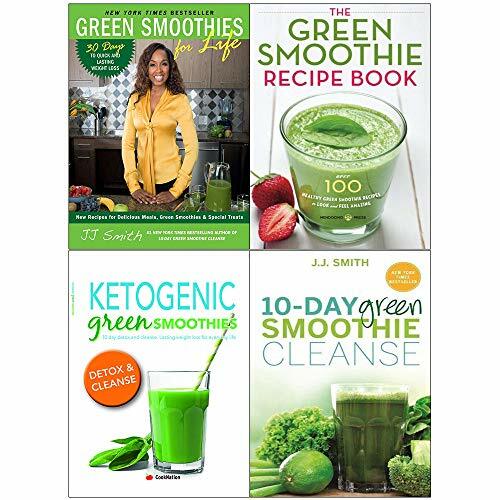 In her new book, Green Smoothies for Life, Smith presents a way that green smoothies can be incorporated into your daily regimen., 10-Day Green Smoothie Cleanse: Lose Up to 15 Pounds in 10 Days! : The 10-Day Green Smoothie Cleanse will jump-start your weight loss, increase your energy level, clear your mind and improve your overall health. Made up of supernutrients from leafy greens and fruits, green smoothies are filling and healthy and you will enjoy drinking them., The Green Smoothie Recipe Book: Over 100 Healthy Green Smoothie Recipes to Look and Feel Amazing: Looking for a fast and easy way to boost your health? Go green! Green smoothies are flavorful drinks packed with disease-fighting vitamins and antioxidants. With The Green Smoothie Recipe Book you’ll be able to improve the way you look and feel by replacing unhealthy high-calorie foods with nutrient-packed green smoothies., Ketogenic Green Smoothies: 10 day detox and cleanse. Lasting weight loss for everyday life: For those looking to lose weight and improve their overall health, Keto smoothies are a great tool to turn to. Our collection of delicious smoothies & juices have been designed to complement your existing Keto diet. Devised to detox your body we suggest you consume 2-3 smoothies from the detox and energising chapters of this book for 10 consecutive days as part of your balanced daily Keto eating plan.